Two Races and a New Bike - One Busy Weekend! We set off for Sheffield after work on Friday. That journey was uneventful - there was a vague sense that the van might not be too happy, but nothing too worrying. We set up camp for the night in a lovely little site on the outskirts of Sheffield where it was easy to forget you are literally minutes from the M1. As most of you MTB'ers know, the weather this weekend was awesome just about everywhere in the UK. Waking up to the sun on Saturday morning - even at 5:30am - was lush. 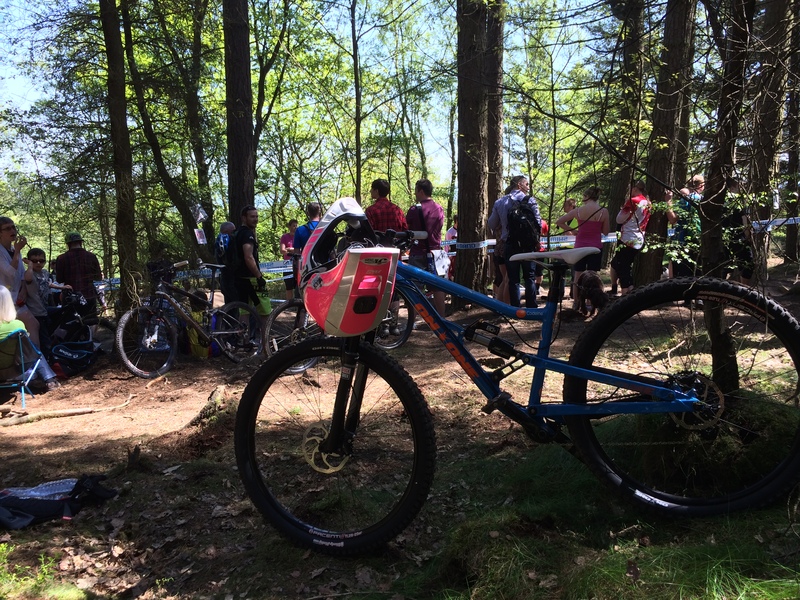 We got ourselves sorted and headed to Greno Woods, the venue for the Steel City DH. Order of the day was to first collect my new bike! My sponsors On-One have just started getting in orders of their new bike, the Codeine and today was the day I got to lay my hands on mine. Up until now, I had been on an old prototype and to say I was excited would be an understatement! The bike lived up to expectations: it's fully kitted out with X01, Cane Creek shock, Rockshox Pike forks and Avid X0 trail brakes and in a wicked blue/orange colour scheme. It looked mint and after riding the prototype I knew the bike wasn’t going to let me down. This bike is a trail-eating machine and as enduro-ready as you can get! So, after some hasty adjustments and a quick track walk, it was off for the first practice run of the day. 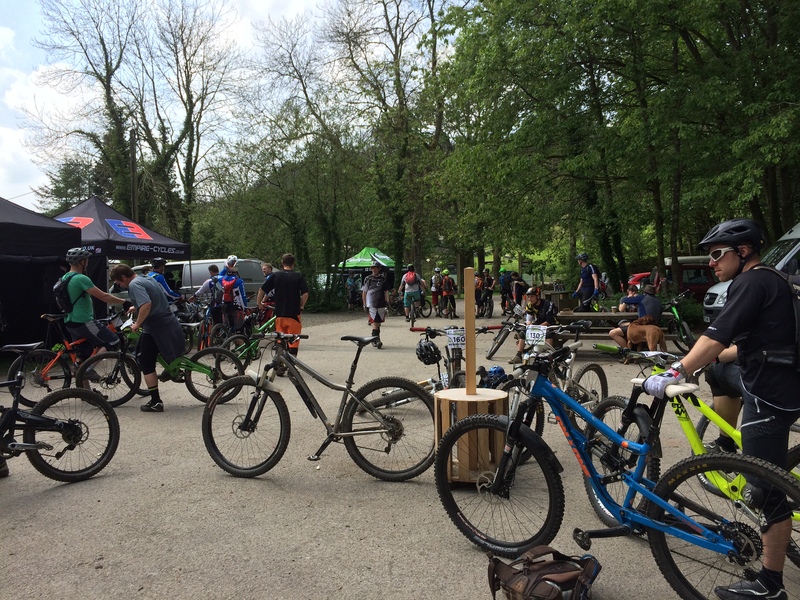 Bang on 9am and the woods were heaving with bikes and people. It was a 15 minute queue to even start a run and all riders were required to do two whole practice runs. This meant starting on the start ramp twice and getting a tick on your number board. This also meant a long wait in the queue... After my two runs were done, I went off further down the track to session a few bits including a gap jump and a rock garden which required a specific line choice to stay smooth and fast. The track at Steel City was fun, pretty quick but not on the steepest hill you’ve ever ridden. This meant that it was accessible for all and perfect for a trail bike, just what I think the organisers were looking for. With 50 ladies entered in two classes, it was obvious this approach works, with loads of first time racers giving it a go alongside seasoned pros! This created a great atmosphere without too much pressure and those that could stamp on the pedals and pump the berms to the max were finding lots of speed. A nice big start ramp sent riders off down the starting straight, over a few table tops and into the first couple of shallow berms. Next up were the trickier corners of the track, flat ones where the track on exit was littered with rocks. Then it was a quick crank on the pedals to get enough speed for the gap jump (with a non-airtime alternative to the side). After the jump were more rocks, then the track flowed down over a couple more rollable jumps and into a series of tight berms before dropping out down into the bomb hole of the finish arena. This was an awesome set up - the bomb hole was surrounded with sponsors tent, food stands, beer supplies, the commentator and most epic of all: the crowds! Peaty’s Steel City certainly draws a big crowd and come race time the gap jump and bomb hole were at least 3 deep with spectators. This was incredible to race down – if you want to know what it feels like to be cheered on at a World Cup DH race then get along to Steel City, it’s just the same! Here is Team Codeine rider James taking us down for a track preview. My first run down was my best, getting me a 4th place. I was pretty happy with this after so little practice. It was a long wait (3 hours) between runs so I found myself a nice spot near to the gap jump and soaked up the atmosphere and the sun! Nearing the time for my second run, while I sat at the top chatting with the other girls, we learnt that one lady had had a big crash and knocked herself unconscious (I have since then heard that this lady is making a full recovery). This meant a longer wait for us and when I finally got on the start ramp I felt like I was just picking my bike up at the beginning of the day – not good and needless to say I was slower down this time. I finished the day in 4th place which I was still mega pleased with, especially seeing as the ladies in front were these three pro’s – 1. Emily Horridge, 2. Carrie Poole and 3. Adele Peat (yup, as in Steve Peat’s other half). Full results here. The other highlight of the day was On-One Team Codeine rider Freddie Oxley pulling a 3rd out of the bag in the Pro men's category behind Eddie Masters and Steve Peat himself! So, with one days racing down we set off for our next destination – Grizedale in the Lake District. By now our van had broken down and we have swapped to a hire van. We ditched the broken one in Sheffield and crossing our fingers all Sunday that it would still be there on the way back through (it's hard to ride with crossed fingers you know)! Getting to another campsite at 8pm we were glad to get to sleep, hoping to feel refreshed for racing the second round of the Empire Cycles PMBA Enduro series. Up and about pretty early on Sunday, we got to the event venue before 8am in order to register and start practice. This enduro was a one day race, with practice in the morning and then racing starting in the afternoon. The start arena also doubled as the finish line and was a real focal point for the day, placed perfectly near the cafe. With music playing the atmosphere was great - the races we went to this weekend certainly had the après-bike stuff covered! We started in groups of 10 and found ourselves lined up on the start next to someone my boyfriend Ad knows from a coaching weekend, what are the chances?! That's what I love about enduro, there’s always a friendly face. By the end of the afternoon, I was cheering on the rest of our group and comparing stage times as we all rode round together - a great race atmosphere. Having not done the first round of the series, I wasn't sure what the guys at PMBA would provide. It is Grizedale so was thinking natural rocky, loose terrain with some muddy fun in the woods. But then again the race was being held at a trail centre so surely there was going to be some man made trials thrown in. As it turned out, the stages of this race weren’t the most varied I have ever ridden and there was a lot of trail centre sections. I was about to write that Stage 1 was the most physically demanding, but then I remembered how I felt at the end of each stage and cancelled that - all stages were hard on the lungs, hard on the legs and hard on the brain! Stage 1 particularly so, that might be something to do with it being a red route climb in reverse. Ride this at race pace, with another rider breathing down your neck only 20 seconds behind you and believe me, it's pretty horrendous! Just to top it off, throw in some big slabs of rock requiring some trials-like manoeuvres and it gets pretty testing. I bet I was not the only one to be very glad to dib out at the end of the stage. Stage 2 started in the woods, quickly descending the right way down a red route shortly after this began the mother of all fire road sprints! At least 300m of lung-busting, uphill pedalling! It was an absolute killer, I averaged 193bmp and maxed out at 195bpm of this section alone! It took almost as much strength to regain your composure and drop off the fire road onto the red route again. This made up the end of the shortest trail of the day, swooping down on a typical red route descent - nothing too tricky here. Stage 3 was a completely different kettle of fish! It was a much more technical track than the last. It started with a steep, loamy top half that would have been treacherous in the wet. Thrown in were some native Lake District boulders which some pumped over and others hopped, slid and dabbed feet in order to get down. Out of the trees the track then went straight down the side of the hill, with pretty much no grip. In my race run I felt my bike get a bit ‘off kilter’ to put it mildly. Not wanting to stop, I did the only other thing possible – let go of all brakes and hope for the best! It worked, dabbing a foot at the bottom as I carried WAY too much speed into the corner. I thanked the 29er wheel gods for carrying me across the rough descent. Across a fire road and the track moved onto the black trail centre route. A few berms and jumps later and it was time to get your sprint on again. Uphill (the least preferred gradient) this one took in another 300m of fire road... max 193bpm of hell! Dropping in again to the only slightly damp part of the course, it was time to negotiate slab style rocks and tight corners before a sprint to the line, nicely finishing in the start arena. I found it to be a pretty testing and varied day's riding, the best I could do for On-One was a 4th. I know I let time slip away from me in the pedal on stage 1 and then made expensive mistakes in both of the other stages. I go away from this with the PMBA organisers reminding me that enduro isn’t all just downhill. It requires grit, determination and the ability to pedal through the pain – something I am going to try my best to dig out before round 2 of UK Gravity Enduro and upcoming Enduro World Series!